Streaming games from a PC with Steam on it is something Steam's been capable of for a while, but I've taken little advantage of. I don't have a PC connected to any of my TVs, so it's been limited to me playing Luftrausers on my little Linux Mint-running netbook. I was really impressed with the smoothness of the streaming, despite Luftrausers being a fast-paced arcade game and the whole ordeal running over my wireless network on my tiny, underpowered netbook. When Valve unveiled the Steam Link and Steam Controller, I jumped on it just for the chance to do some game streaming to my TV in a fashion much cheaper and more effective than building a whole media center PC. The results have been mixed at best. Let's get something out of the way first: I am not a hardware reviewer. I'm not counting pixels or framerates. I rely on real reviewers to tell me what works and what doesn't on a technical level. Occasionally, I make a dumb first-adopter purchase because I can. It's fun to take a risk every now and then. All that to say take this as anecdotal information at best. I'm not trying to tell you what to buy, but give an earlier than retail look at something I was really interested in. 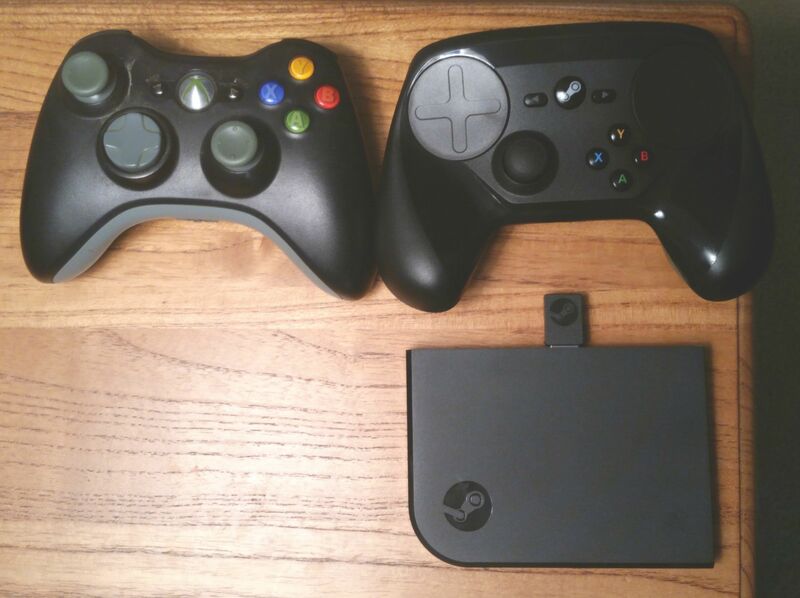 Steam Controller upper right, Steam Link (with Steam Controller dongle) lower right. Xbox 360 controller upper left for reference. Setting up the Steam Link was really easy. I plugged it into the power, and HDMI, and walked through the process of selecting my language, signing into my wifi network, and choosing a PC to stream from. My partner and I are both running Steam, so I was given the option of which computer I wanted to stream from. The Steam Link gave me a code to enter into my PC to enable the streaming link, which was the first of many trips to my PC in support of the Steam Link. Then it downloaded an update or two, and rebooted a couple times. All expected behavior at this point. You would think the Steam Controller would be more simple than that, but you would be wrong. The first thing it wanted was a firmware upgrade, and the Steam Link wasn't capable of providing it. 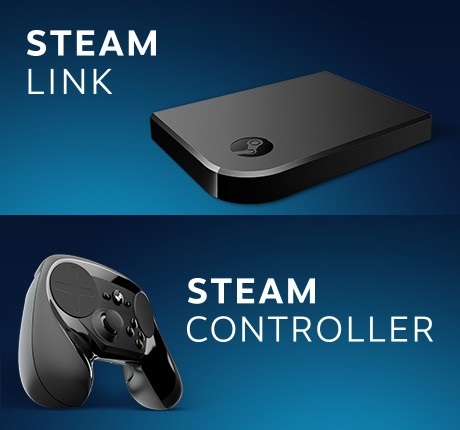 Obviously, anyone with a Steam Link or Controller is going to have a PC running Steam on it, but it was real annoying to have to also take the controller to my PC to give it an upgrade. Valve mercifully provided a micro USB cable to enable these type of upgrades, but it seems a little annoying that the Steam Link itself couldn't provide this kind of update. When I first set it up, I wanted to put the Steam Link to the test. I hooked it up to the TV that's furthest away from my wireless router. Finding my wireless networks was no problem. However, the performance of the stream left a lot to be desired. Graphical and audio hitching was frequent. To give some perspective, this same TV has a Roku 3 attached that has no problems streaming Netflix or Hulu in 1080P HD on the same wireless network. I moved it to a TV about half of the distance away from the wireless router and performance got a lot better. Don't expect TV or movie streaming performance out of the Steam Link. Also, no matter how close you are to your network, don't expect to get anything done while Steam is downloading a game. The Steam Link becomes incredibly unresponsive while any game was downloading. However, starting a game will pause downloads, which allows the Steam Link to stream as normal. When I bought the Steam Link, I thought it'd be a great opportunity for my partner and I to play local multiplayer stuff, like Nidhogg and Gang Beasts. Nidhogg was the first game I started, and it worked flawlessly. Looked like it does on my PC, instant input response, lots of fun. However, that was probably the best experience I've had streaming. Some games work, but theyv'e got problems. Either they play far too slowly to be enjoyable (such as with Shadownrun: Dragonfall) or the streaming will crash Steam when you quit the game, necessitating a trip to the PC to kill the game and restart Steam. I also experienced some games that would dump to the Big Picture Mode interface while the game is still running. There was no obvious way to switch back to the game from the Steam Link, so I would have to go back to my PC to kill the game. Some games didn't work at all, either presenting nothing but a white screen when streaming, crashing when the game begins, or not accepting any Steam Controller input. There were also some little annoyances that accompanied a stream crash. One of those was that the stream will automatically mute your PC, but when it crashes, it doesn't unmute when you restart. Not a big deal, but annoying. I don't have a whole lot to say about the Steam Controller. It has two trackpads with some haptic feedback. The ABXY buttons are a little too small, but the analog stick is fantastic, as is the shoulder triggers. Whether a game supports the typical Xbox style controller is mostly irrelevant; the Steam Controller can be configured to emulate any keyboard or mouse button press. This means games that don't natively support a controller, such as Dungeon of the Endless, can still be played with the trackpads acting as mouse movement, and buttons emulating keyboard and mouse. In nearly all games, the Steam Controller worked great. The one game it didn't work on was You Don't Know Jack. It wouldn't accept any Steam Controller input whatsoever. My first night, I played five games, and three of the straight up didn't work. It put a real damper on my enthusiasm. After working with the Steam Link for a little while, and trying out different games, I'm a bit more optimistic. For the games it works on, it does everything you'd want it to. But when it breaks, get ready to walk back to your PC to fix things. It's got a lot of annoyances and feels more like a beta product than a final release. I'm absolutely not giving up on it, but I get the feeling us early adopters are the unwitting true beta testers of this thing before it gets a wider release in November. What it is really missing is an honest list or showcase of games that work great and show off the Steam Link and Controller. I would be less annoyed if I weren't testing these games myself to find out what works and what doesn't. Since this isn't a review, I don't feel compelled to adhere to a review score. Therefore, here's an emoticon sequence describing my reaction to the Steam Link and Controller.